The best properties of two comparable fibers, polypropylene and polyester, create a very high strength, light weight and competitively priced rope. Extra-Lene® isa a composite rope built with a classic "poly-dac" polyester over polypropylene construction. 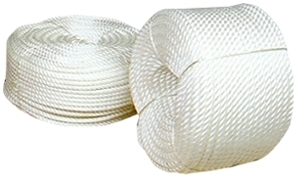 Polypropylene provides a high strength, light weight core while the polyester cover yarns provide excellent resistance to abrasion and UV degradation which extends the service life of the rope. Poly DAC ropes are not subject to deterioration by petroleum products and most chemicals. It will not rot or mildew and 2" (51mm) diameter and larger ropes will float. Extra-Lene® is engineered to balance the elongation characteristics of both fiber types. The rope features the superior wear characteristics of an all polyester rope with an economic, lightweight core. Primarily used as arborists tree rope, bull rope, hand lines, ladder rope, scaffold lines, tie downs, hoisting, guy lines tent ropes, commercial fishing, barge lines and mooring lines. TENSILE STRENGTHS are determined from tests on new, unused rope in accordance with standard test methods of the Cordage Institute. For freight information or to order Email or call Jay @ 763-263-9835.